We had an inverter go bad on us while we were in Mexico, so we know that these things do happen. And at the time we purchased a replacement 400 watt unit to do us until we could get something better. We bought the better unit at Canadian Tire last September 2, on sale for $99. So, I told Tana and Graham to simply replace the 1,000 watt unit with the 400 watt spare one that I had stored in my tool box compartment. I haven't heard back from them, so hopefully that's the end of story until they get back here and I can take the other one in for warranty replacement under it's one year guarantee. Coho was playing with the curtain, and then simply decided to fall asleep. He plays hard...and then he crashes. It's too funny. Year one still makes me laugh! Our daughter Lindsey is doing the same photo timeline with granddaughter Sadie, except with a cob of corn as the prop. She'll wait until local corn is on sale though! 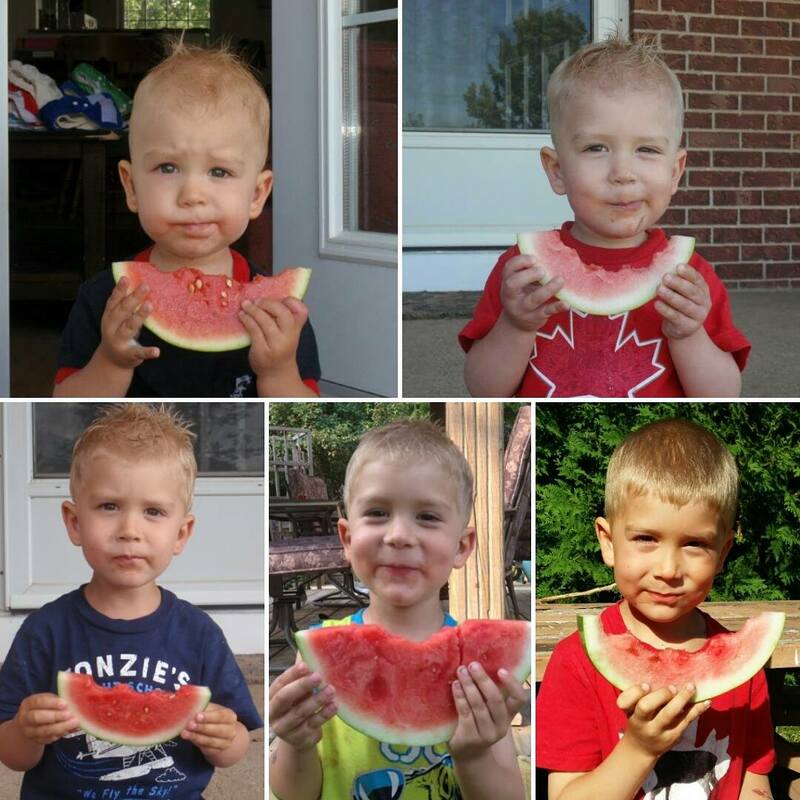 Cameron's watermelon pictures could become a great morph video someday. He is difinitely a cutie! He is a cutie for sure and I love the expression on his face especially in the first two photos. Well, if that's the extent of the "problem" with Sherman, then it's all good. Soooo many things can 'go south' in a moving house. It's all good if they have read this post and see that we have the extra inverter. For some reason they don't seem to be getting Kevin's reply emails, or his facebook messages. So we have no idea what they may be doing about it but yes, if that is his only issue that things are going well. These things do happen, ours has lasted us many years, though the first one just died after the warranty ran out, Like you we have a 400 watt invert that we could use if need be, that we use in the car. Our first inverter lasted a number of years and yes, they do go bad. It is a shame that it didn't last longer than that though, at least it is still under warranty. We have no problem with buying products at Canadian Tire, sometimes you can get some great deals there. Their car service department is an entirely different story, NEVER again will we EVER use them! Yes, those cheap "no name" inverters have a penchant for failing at the exact wrong time---then the manufacturer just changes their name and the cycle continues. Glad it happened under warranty, and you had the spare in the toolbox. Hopefully Tana and Graham don't need to run appliances that use more than 400W (hair dryer and coffee maker come to mind). Go Coho! I could really use him right now, my RV has been under a continuous mouse invasion for the past two weeks---still cannot figure out where they are getting in! Hopefully Tana and Graham have gotten our message as we haven't heard back from them but no there aren't really any appliances to run in Sherman. No coffee maker or hair dryer, just a toaster and kettle and only the toaster could have been used with the 1000 watt inverter anyway. Coho has yet to actually catch a mouse so not sure how good he would be for you. Sorry you are having a mouse problem, I hope you can figure out where they are getting in. Great photo timeline. Much better than the "first day of school". He doesn't seem too sure about that watermelon in the first one but he definitely changed his mind. I agree, it is a great yearly photo op! Aha, smart lady -- wait till corn goes on sale! Cute timeline. Kitties can sleep in the weirdest positions, he's so cute. Yes, they can! Coho is funny because he never "makes a bed" he just flops down and goes to sleep. Glad it's only the inverter! First time in a Canadian Tire was a couple days ago - WOW! it's worth a stop no matter what hardware/campware or hockey gear might be on the shopping list! Oh and they do sell tires :) BTW I've had great luck with both 1000 Watt Xantrex inverters (modified sinewave) we use. Great header picture. That was our stomping grounds for several years. Man was that nice. December on the Gulf coast with no one there but us. I loved that beach. We really loved the beach area there, totally quiet and peaceful. We would have stayed there longer but the wind was very strong which made things cool, so it wasn't as enjoyable in that sense as we would have liked. Shared cat photo with my mom and sister who have cats- too cute! I hope they enjoyed it! Great idea withheld camera shots of the kids. Boy do the kids grow up fast. Yep, we agree, it is a great way to show a timeline of them. Can't wait to see Sadie's photo.